We provide statuary and non-statuary audit services for private and public clients. Our experienced and professional staff, combined with the high level of quality control standards in SHINSOH, allow us to keep on providing high quality services. In order to guarantee the quality of the certified level of audits, irrespective of which CPA or auditing firm is in charge, the level of audit reports prepared by certified public accountants (CPAs) is maintained by generally accepted audit standards. As well as maintaining the quality required for the certified level, we at SHINSOH also place emphasis on how smoothly we can achieve the level, and how effectively we can exert our strong leadership. In the audit process, we aim not only at filling in the given format, but also at securing the client’s integrity, based on the deep understanding of purpose which GAAS or GAAP expect, and on the client’s current situation. To achieve the above, it is our principle to establish our own audit tools. As a result, we know that we can perform effective audits. 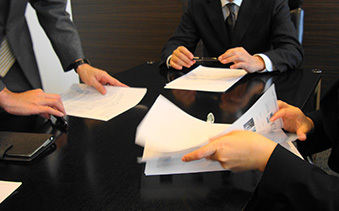 Another special feature of SHINSOH is that each auditor makes frequent visits to his or her clients, so that problems, if any, can be solved properly and in a timely manner. We try to provide proper, not perfunctory, advice that matches the purpose, to carefully examine the points at issue, to conduct a thorough discussion, and present a clear explanation. In auditing, discussions between the management and the auditor are indispensable, as it is very important that everyone understands audit risks through mutual discussion. The mission of SHINSOH Audit & Co is to exert strong leadership which results in solving problems and contributing to clients’ growth. Accounting is meaningful only when it supports management. In various situations in a wide range of business activities, we want to seek the best solution for each client, and together create a positive turning point. We believe the driving force of the management is essential in leading a business to success. The most energetic people in a company are the management. We respond to this energy and react to their demands. Although few of the questions we are asked by management are simple to answer, we always seek for different possibilities, creating more options, and proposing the best means to solve the problem. In seeking the answer to problems, we consider brain-storming to be an extremely valuable tool. By talking face to face, we can deepen mutual understanding. We can generate ideas together and mutual trust develops. Recently, we are often approached for consultations on overseas expansion and/or organizational restructuring. We sometimes take part in the restructuring of a business in order to regenerate the business model. While many companies are making all-out efforts to tackle the challenges that face them, we need to provide them, not just with useful knowledge, but with ideas that far exceed their expectations. Accounting can help both manage business units and formulate business plans. Although it is not very well known, accounting is very good at discovering added value which has not yet been discovered. It is still rare for CPAs to be involved with the formulation of business plans or with organizations at their beginning. However, wherever possible we like to join a project from an early stage so that we can give strategic advice from the view point of accounting. Copyright © SHINSOH AUDIT CORPORATION All Rights Reserved.